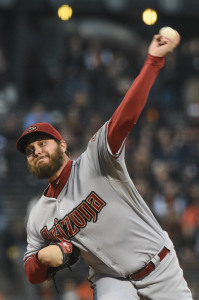 The Red Sox have officially added lefty Wade Miley in a trade with the Diamondbacks, the teams announced today. Right-handers Rubby De La Rosa and Allen Webster, along with infielder Raymel Flores, make up the return for the D’Backs. Miley has been the source of several rumors during these Winter Meetings, with the Rangers, Marlins and Blue Jays all with varying levels of interest in the southpaw. Miley is projected to earn $4.3MM (by MLBTR’s Matt Swartz) in his first time through the arbitration process this winter, and he’ll be under team control through 2017. Over the last three seasons, Miley has posted a 3.74 ERA, 2.66 K/BB rate and 7.1 K/9 while averaging an even 200 innings per year. He has a 48.6% ground ball rate over his career, which will serve him as well at Fenway Park as it did at Chase Field. Miley posted a 3.98 FIP, 3.50 xFIP and 3.67 SIERA in 2014, so the advanced metrics suggest that he was somewhat unlucky to produce his 4.34 ERA. While Miley isn’t the durable lefty the Red Sox were hoping to land during the Winter Meetings, Miley is at least younger and far cheaper than Jon Lester, and he’ll slot into the Boston rotation alongside Clay Buchholz and Joe Kelly. Boston is undoubtedly still looking to acquire at least one or possibly two more starters for 2015, including a Lester-level ace in free agency or the trade market. This is the second high-profile deal that De La Rosa and Webster have both been a part of, as the two righties were part of the trade package that Boston received as part of the Adrian Gonzalez/Carl Crawford/Josh Beckett blockbuster with the Dodgers in 2012. As Jack Magruder of FOX Sports Arizona points out, Diamondbacks senior VP De Jon Watson was in the Los Angeles front office when De La Rosa and Webster originally joined the Dodgers. De La Rosa appeared in 30 games for the Sox (18 of them starts) in 2013-14, posting a 4.54 ERA, 2.16 K/BB and 6.4 K/9 in 113 innings. With Boston openly looking to add top-level starting pitching this offseason and a number of highly-regarded pitching prospects in the minors, it seems as if De La Rosa may have simply been squeezed out of a job with the Sox. Webster also struggled at the Major League level (a 6.25 ERA over 89 1/3 innings over the last two seasons) but has a higher prospect pedigree than De La Rosa. Webster entered the year ranked as a top-100 prospect in the game, albeit over rather a wide range — he was ranked 46th by MLB.com, and 88th by Baseball America. The righty posted strong minor league numbers and was described by the 2014 Baseball America Prospect Handbook as having “outrageous” stuff “suggesting top-of-the-rotation potential” but there were big questions about his confidence and fastball command. That brings us to Flores, a 20-year-old middle infielder who played at the low-A level last year in his age-19 season. Flores hit .282/.344/.354 over 233 plate appearances, adding 14 stolen bases and one long ball, but he is known primarily for his glove. FOX Sports’ Ken Rosenthal and Jon Paul Morosi first reported the deal (via Twitter). Jon Heyman of FOX Sports reported on Twitter that it was finalized. Nick Piecoro of the Arizona Republic (via Twitter) and MLB.com’s Steve Gilbert (via Twitter) reported the inclusion of Flores.